Any company or e.g. social entrepreneurship organisation can contact the project with questions or proposals: zahorka@libertas-institut.com. „CCC“ means Cooperation Causes Competitiveness – the key for economic success for all kinds of enterprises who now, in a big European Single Market, have to cooperate to remain or become competitive. This concerns mainly Small and Medium Enterprises. Whoever is in synergy with other, suitable organisations will finish in a bigger market, for exports, imports, services etc. To foster this by e.g. a better knowledge of export techniques, inter-cultural management and EU legal forms, the CCC project has been launched in the framework of the EU Life Long Learning Partnerships projects, during a kick-off meeting in the pittoresque university town of Tübingen/Baden-Württemberg, Germany. Project partners are: Europe Direct Information Center/Regional Economic Development Agency – Stara Zagora, a dynamic info point from the centre of Bulgaria with a lot of project experience; Europe Export Consult A/S – Charlottenlund, Copenhagen, an export consulting company with a long-year history in EU projects and the Danish Trade Board, Denmark; Fundación Universidad Empresa de le Región de Murcia/University of Murcia – Murcia/Spain, a seasoned project management unit combining the university and enterprises; LIBERTAS – Europäisches Institut GmbH – Rangendingen/Baden-Württemberg, including the European EEIG Information Centre, for the first European cooperation-suited legal form; as well as EUROCOM srl. from Italy, a VET-experienced training institution (which could not send a representative to the kick-off meeting), offering all kinds of courses to young, adult, professions and companies. 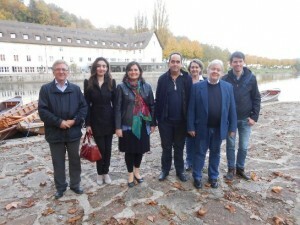 The CCC team – with a part of its meetings also on board of a punting boat on the Neckar river – determined the meetings, seminars and other measures during the project duration which will end in Summer 2015. New: CCC-website has been launched – www.ccc-cooperation.eu. The subjects will be oriented in the full use of the Single Market, in an own European cooperation culture, in the inter-cultural experience which may be known when doing European business, in the overview on European legal structures which are to help enhancing the results of businesses – on everything which brings companies together. The participants will also work on a self-text by computer, in order to enhance the individual cooperation capacity. 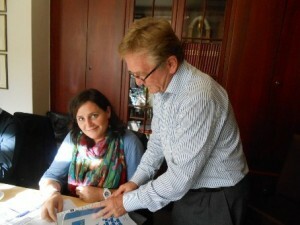 Snapshot from the session: Hans Jørgen Lorenzen (right) admires a publication from Murcia; left: Consuelo Garcia. 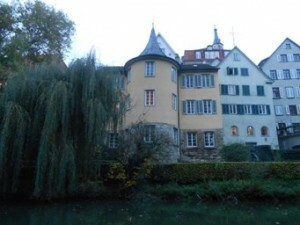 View from the Neckar river on the tower, where the poet Hölderlin lived for 37 years. Picture taken from the session on a punting boat.